Nothing quite beats the enjoyment of cooking and dining outdoors. 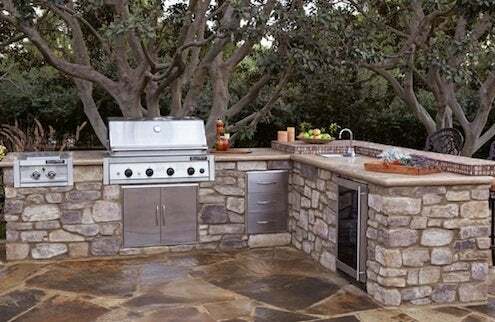 Fortunately, creating a lovely open-air kitchen is now within the reach of savvy do-it-yourselfers, thanks to companies like Eldorado Stone, a California-based manufacturer of cast stone veneer products. 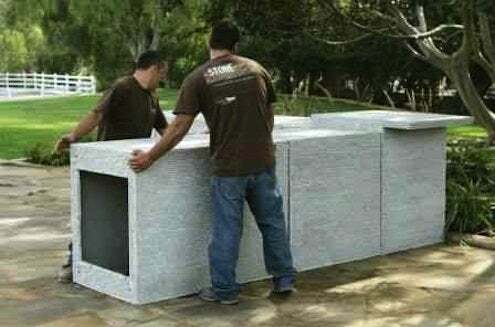 Eldorado Outdoor offers a series of modular units constructed of glass fiber reinforced concrete (GFRC). These boast the benefits of being both lightweight and extremely strong. Similar to indoor kitchen cabinets, they’re easily combined for a customized setup to match the footprint of an outdoor area. And they can be installed over any solid surface—concrete, pavers, and brick are all options. 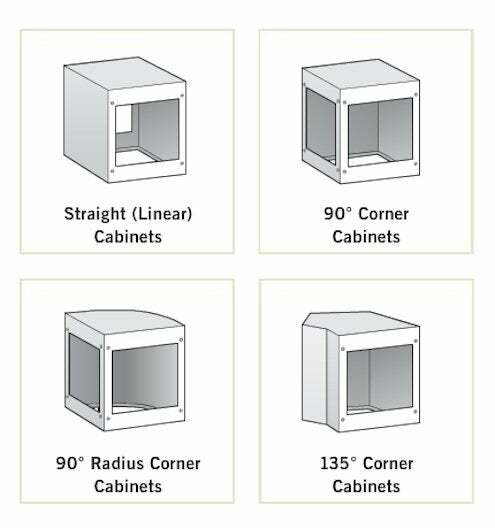 Eldorado’s cabinet ‘building blocks’ come in a variety of shapes and sizes. Among them are straight cabinets (30″ wide by 36″ high, 12″ to 60″ deep), 90-degree radius corner cabinets, and 135-degree angled corner cabinets. To help customers mix and match components, the company offers an online design tool for creating three-dimensional layouts. All pieces are completely molded and fit together with metal fasteners and construction adhesive. An integrated factory scratch coat guarantees a consistent groove depth, which only makes it easier to apply the stone veneer. And because the units can be cut with a conventional diamond saw blade, any size grill may be installed on-site. The cabinets are open at the base to accommodate water lines, gas hookups, or electrical wiring. The Eldorado system saves both time and money, according to Spann. “Creating an 8-by-6-foot kitchen using conventional CMU (concrete masonry unit) concrete block would typically take three to four days; creating the same kitchen with our units would take three to four hours, at a 25 to 30 percent cost savings,” Spann asserts. Average pricing for the Eldorado product is $150 to $175 per lineal foot, including Eldorado Outdoor Cabinets and Eldorado Stone. The price does not include the countertop surface, appliances, or installation. The products come with a 50-year warranty and are available nationwide. For more information, visit the company’s web site here.